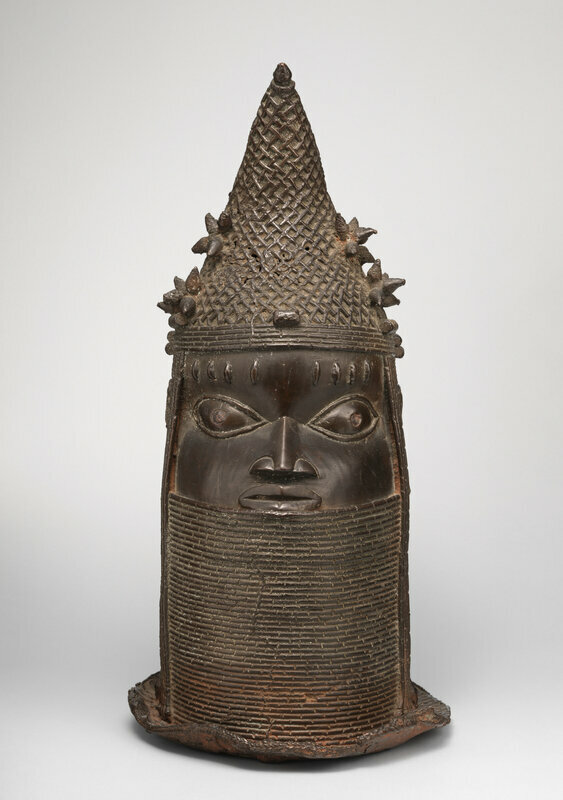 Head of Iyoba, Edo peoples, Nigeria, Court of Benin, 18th–19th century. Brass (cast), iron. H. 21 in. × W. 10 1/2 in. × D. 10 3/4 in. 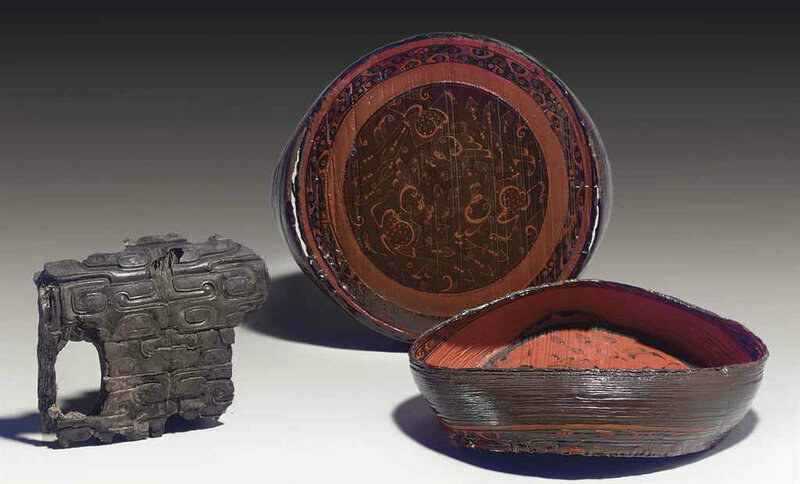 (53.3 × 26.7 × 27.3 cm). Gift of Mr. and Mrs. Klaus G. Perls, 1991, 1991.17.4. © 2000–2018 The Metropolitan Museum of Art. In the Benin kingdom, the iyoba, or mother of the oba (king), occupies an important and historically significant place within Benin's political hierarchy. The title was first conferred upon Idia, the mother of king Esigie, who used her political skill to save her son's kingdom from dissolution in the late fifteenth century. Ever since that time, queen mothers have been considered powerful protectors of their sons and, by extension, the kingdom itself. Because of the enormous esteem in which they are held, iyobas enjoy privileges second only to the obahimself, such as a separate palace, a retinue of female attendants, and the right to commission cast brass sculptures for religious or personal use. 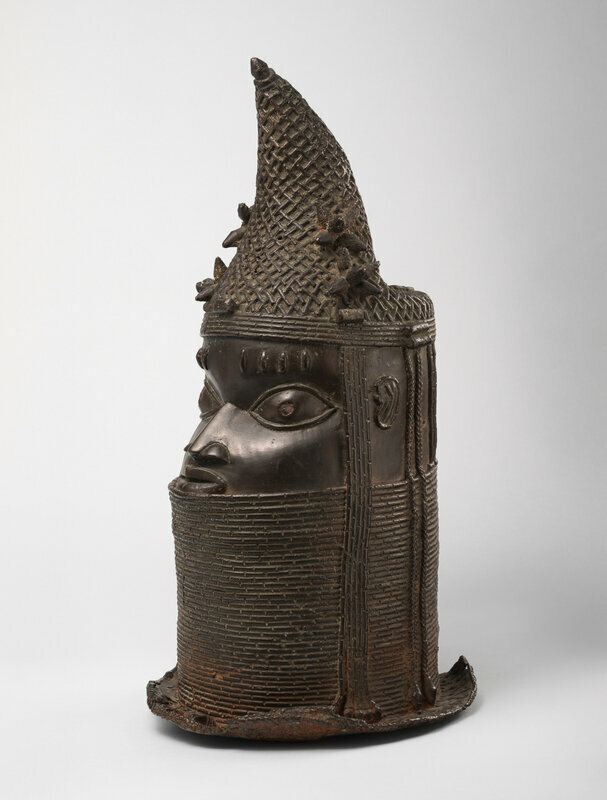 Ancestral altars dedicated to past iyobas, like those of past obas, are furnished with cast brass commemorative heads. The heads of queen mothers are distinguished from those of kings by the forward-pointing peaks of their coral-beaded crowns. 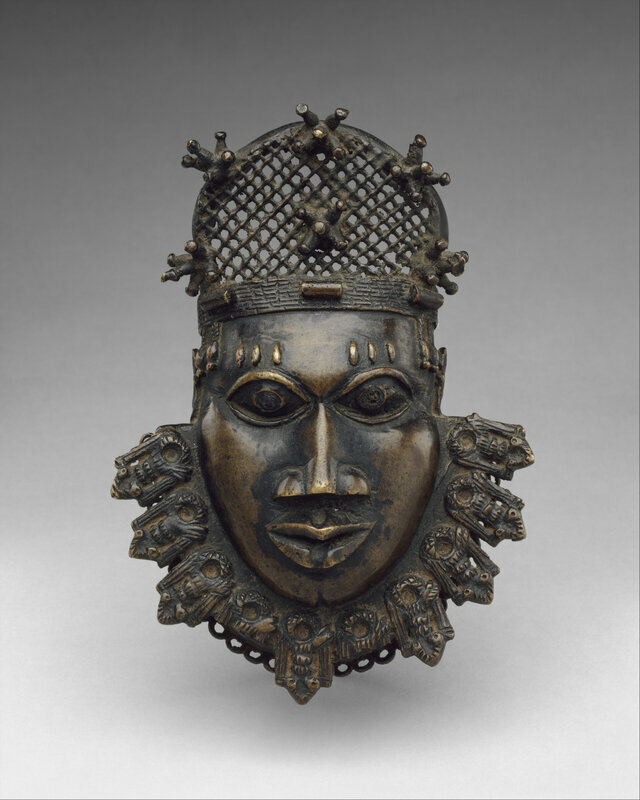 Commemorative heads of iyobas hold to the same stylistic chronology as those of obas. Earlier heads were cast with thinner walls and display tight beaded collars that fit snugly beneath the chin. Later versions have thicker walls, exhibit enlarged cylindrical collars that cover the face up to the lower lip, and are designed with a circular opening behind the peak of the crown to hold a carved ivory tusk. With its high and narrow collar, extensive hair ornament, and pierced crown, this commemorative head of an iyoba dates from the eighteenth or nineteenth century.